Another Monday, another dollar! I'm looking forward to the end of this week, as I'll be starting my long awaited New Orleans vacation! That being said, I totally forgot to line up some posts for the week that I'm gone, so pardon my absence. I'll try to post if I have time, but most likely I won't. I wish I had some back up posts for you, but it's so hard to get ahead, especially when LO doesn't want to fall asleep at night. Today's post is going to feature the new Revlon Colorstay Gel Envy line that is appearing now in stores. If you haven't heard, the older line is getting phased out and can be found on clearance at most stores, and these new Colorstay Gel Envys are replacing their displays. With the words Gel Envy, I can only imagine that these are suppose to super high shine along with the well known Colorstay durability. I picked up a couple(thanks to sales, coupons, and Extra bucks) and of course my eyes bee-lined straight to the deep royal blue cream called Wild Card. 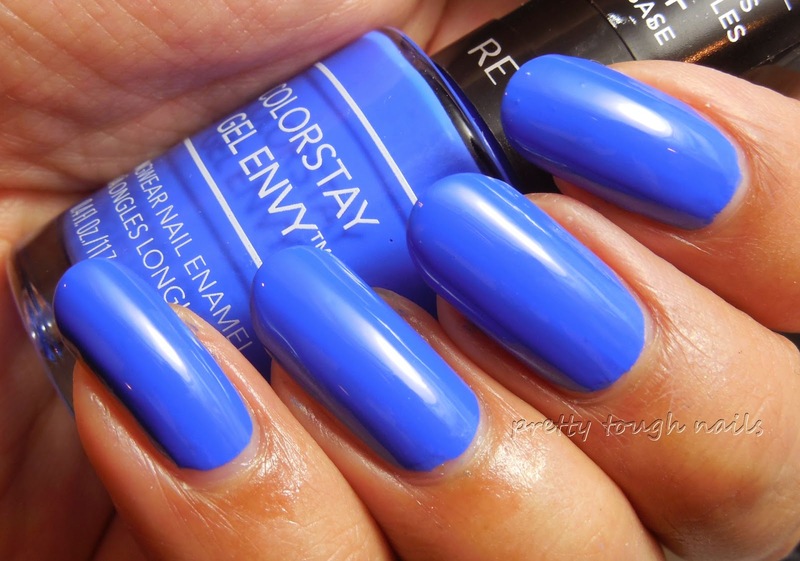 This is similar to those deep luscious blues like Nails Inc Baker Street and Sinful Colors Endless Blue. Unfortunately the deep blue freaked my camera out and I couldn't get it to show up on film as deep as it is IRL. The formula was perfection, with low viscosity and super high pigmentation. The brush is a pro-wide brush too with tapered corners which make maneuvering it a breeze. I only needed one coat, just like the traditional Colorstays, but I used two out of habit. And yes indeed-y, this dried to a super high shine without any need for topcoat. Win! And just because I can't leave any good ole cream alone, I had to top this with a glitter topper. I used Revlon Heavenly from the core line, and this pretty little thing has tons of hex and square glitters in iridescent pink and blue. It's a versatile topper that I can see myself using at every opportunity. I only needed one easy coat and then topped this all with a layer of my GCS/Poshe topcoat. I am highly impressed by the Colorstay Gel Envy line, as the colors are super pigmented and only need one coat for a super high shine, making it a perfect color to grab if you're running out the door like I am often am. The brush adds points for me too, as it's not a wimpy drug store brush but rather wide, just like the salon or designer polishes. And if you can get these on sale, it's a total win. I dare say that I would put these on par or above with salon polishes like Zoya or Essie. If you haven't tried these yet, you really should - you don't won't to miss out on these! Hope the week flies by for you, Thithi. Don't forget to go for oysters and the Acme Oyster Bar in the French Quarter (top them with a squrt of tabasco, like the natives like to do) while you're in NO, or get beignets and coffee at Cafe du Monde. If you get your beignets to go, DON'T smell them in the bag -- you'll get a lungful of powdered sugar if you do! Oh boy, I can't wait!! thanks for the tip on the oysters. I need to make sure I get some. I've been to Cafe du Monde before, but of course I'll have to go again. I'm staying near Bourbon street too, so a lot of the sites will be nearby for me. I'm so excited! I can't wait to eat my way through Nola! This combo is really pretty! The polishes look great together. I hope you enjoy your vacation! It sounds like it'll be fun. Thanks dear!! I'll give a full rundown when I get back! !